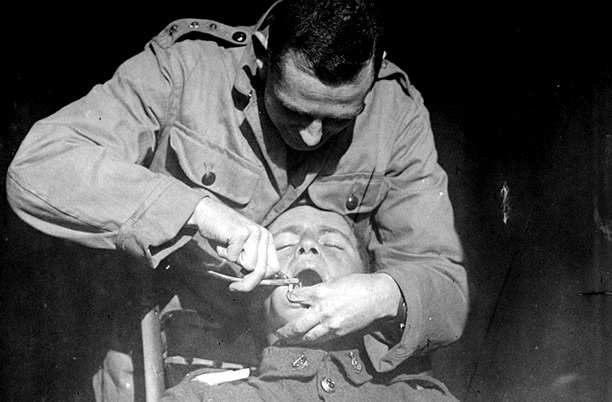 The New Zealand Dental Corps provided dental treatment to military personnel in New Zealand, and in the theatres of war from late 1915. Many men were ineligible for military service because of bad teeth, but with basic treatment these could be brought up to the necessary standard. The Dental Corps, made up of trained dentists, worked in Egypt before moving to the Western Front with the New Zealand Division in April 1916. Dentists were stationed at the New Zealand bases in England and France, on troopships and in mobile dental sections (in field ambulances) which accompanied the Division as it moved around the front. The NZDC’s Major H.P. Pickerill took charge of treating jaw fractures in December 1916 and became an important figure in wartime reconstructive surgery. The New Zealand Dental Corps was disbanded in mid-1919. Cap and collar badges: Two serpents encircling the short rod of Aesculapius forming the monogram ‘DC’, within a laurel wreath, surmounted by a crown. Motto: Ex malo bonum (From evil comes good). New Zealand Dentals Corps shoulder title. We have 19 biographies, 40 articles, related to Medical Units.